As we’ve already mentioned, Apple has today seeded its first Apple Watch Software Development Kit to developers. Called WatchKit, the tools included will allow developers of iOS apps to incorporate the watch as they see fit, so long as they stick within the hardware limitations on offer as well as the limitations that Apple will no doubt apply via its App Store review process. 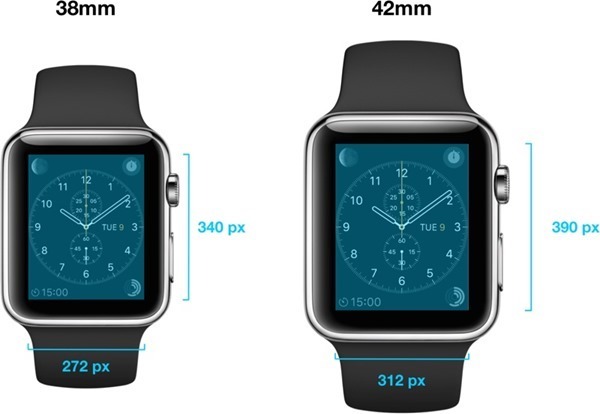 During the initial flicking through of the WatchKit documentation it became clear that the two Apple Watch size variants on offer both feature different screen resolutions, which isn’t really something that we foresaw. Apple is merrily calling both watches ‘Retina’ as per its now familiar marketing strategy for its screens, but the fact that developers must now work with two resolutions in mind is an interesting one. And Apple does indeed expect developers to watch what they’re doing with those screens. As brought to our attention by MacRumors, Apple’s own documentation says that developers can reuse assets across both resolutions so long as the results ‘look good,’ whatever that means. Given the App Store’s already notorious problem with consistency when allowing apps through review, we don’t much like the idea of such wooly wording being in WatchKit right from the off. Apple does go on to say that developers cannot create two different interfaces – one for each Apple Watch resolution – but should instead try to make their apps scale both up and down accordingly. Its a similar approach to iPhone apps now that there are three different screen sizes being sold in Apple Stores today, and it appears the Apple Watch will require developers to be similarly mindful when putting their user interfaces together. Apple’s differing resolutions even means that developers will need to provide two sets of icons, with the Notification Center icon for example expected to be 29 pixels for the 38mm Apple Watch, and 36 pixels for the 42mm device. None of this is going to stop anyone from developing for the Apple Watch, but it is an added layer of complexity that Apple would once try to avoid. These are different days though, and the Apple Watch is very much unlike anything the company has done before. Maybe it’s just time to break with convention after all.